A neighborhood priority is to complete the Baywalk along the entire bay front from 5th Street to 17th Street. And to connect the West Ave Baywalk with South of Fifth, either over or under MacArthur Causeway. Recently, the city negotiated an extension of the Baywalk with the condominium at 1450 Lincoln Road, which will extend over the water so as not to infringe on private property. Baywalk begins at Bentley Bay Condo, 500 West Ave. 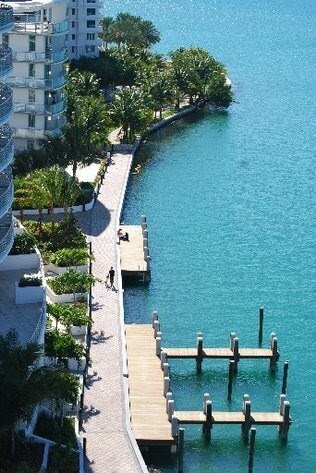 Going north, Baywalk continues behind Bently Bay Condo. negotiations with developer to build baywalk are again underway. No rights or easements granted to the City – (340 ft – 6%) Bay View Terrace 1228 West Ave and Bay Garden Manor 1250 West Ave.
With some focus, all but the last category can be completed and open to the public in the next couple of years which would bring us to 94% completion. $3M FDOT grant Atlantic walkway (July 2017). Can this connect to Baywalk?